Retail Catalog | Camisasca Automotive Manufacturing, Inc.
All frames are made from sturdy, rustproof 20 gauge stainless steel, guaranteed for a minimum of 4 years of exterior use. Available in four different finishes - Polished, Brushed, Black Powder Coated and Black Pearl - in frame styles that do not block DMV registration tags in all 50 states. Universal fit and easy mounting application. Matching finish hardware hider caps are also available to complement your frame. Preserve and protect trunk paint from fingerprints and scratches with an elegant and convenient trunk handle which integrates seamlessly with any 4 hole mounting license plate or license plate frame. Provides convenient leverage for opening and closing trunk. 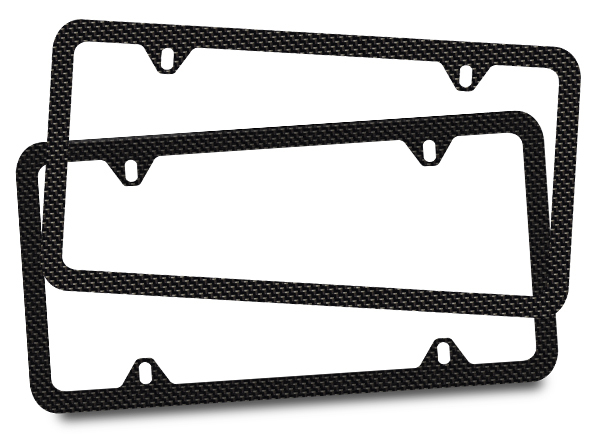 Mounts to lower holes behind license plate frame; compatible with any of our 4 hole frame styles. High quality 304 stainless steel construction that will not rust or corrode. Available in Polished, Brushed, and Black finishes. Patented design helps prevent license plate and frame theft. Our research shows that consumers are looking for license plate anti-theft fasteners, but currently available hardware does not meet their needs. Our security caps address their desire for a more universal fit and rustproof construction. German-made from solid stainless steel, for years of exterior use and a substantial one piece appearance. 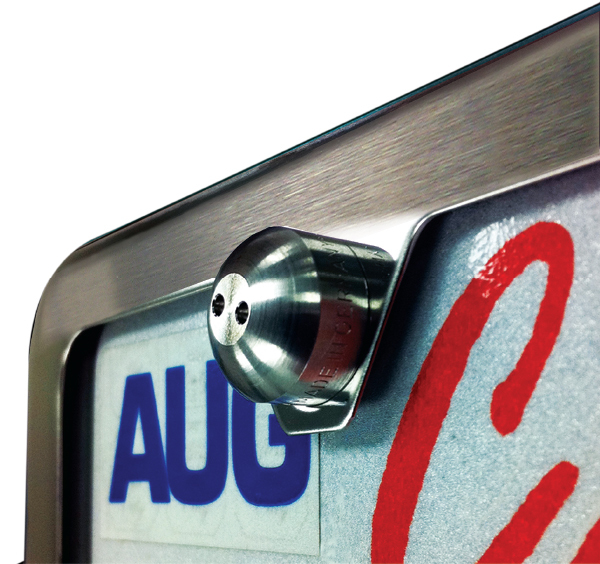 Conceals license plate hardware from tampering, accommodates screw heads up to half and inch. Special hand tool and installation guide included. Comes in hang display packaging suitable for retail sale, or can be added to any of our license plate frames, in lieu of hardware hider caps. Heavy gauge 304 stainless steel license plate frame. Designed for DMV compliance in all 50 states. Secure 2-hole mounting style, with lower plate locking tabs. 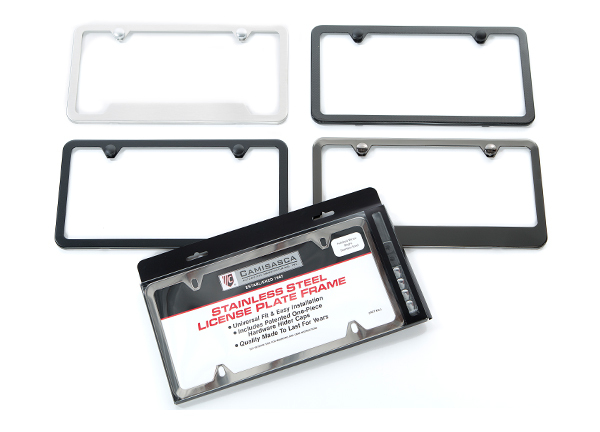 Made from 1/16" clear polycarbonate for maximum protection of license plate and registration tags. Scratch and UV resistant coating prevents yellowing over time. Shields plate from bugs, dirt and road debris. German-made from solid stainless steel, means years of exterior use and a substantial one piece appearance. Patented design conceals plate hardware from tampering, and accommodates screw heads up to 1/2". Includes special hand tool and installation instructions. Universal hardware ensures easy installation. Available to aid the installation of our license plate frames. Includes two of each of the most popular automotive screw styles. 18/8 stainless steel will not rust or corrode. Made from 2 mil thick carbon fiber composite material to meet our OEM quality standards. 50 state compliant in 2 or 4-hole mounting applications. Matching patented hardware hider caps included. All of our carbon fiber composite features an attractive hand polished clear coat that enhances the carbon fiber weave. The finishing touch to elegantly personalize every wheel and tire. Made from lightweight ABS in Satin and Black finishes, each cap features a carbon fiber composite clear coated emblem to complement your rims or tires. Fits all standard automotive air valves and are compatible with most Tire Pressure Monitoring Systems (TPMS). All caps feature an "O-Ring" seal to protect as well as keep the valve orifice clean. Knurled head provides grip for easy installation and removal. Exquisitely made from carbon fiber composite and stainless steel each substantial keychain is approximately 5/16" thick and features a clear polyurethane coating to enhance the beauty of the carbon fiber weave. Our carbon fiber composite keychains feature a genuine leather strap with thick white stitching and handsome sturdy nickel plated flat universal key ring. Our carbon fiber composite medallions are made from stainless steel and covered with a highly durable chrome plated finish. All medallions feature a chrome plated universal flat style key ring made from spring steel that will not lose form when installing keys. All frames are made from sturdy rustproof 20 gauge stainless steel, and guaranteed for a minimum of 4 years of exterior use. Frame styles do not block DMV registration tags in all 50 states. Universal fit & easy mounting application. Graphics are permanently laser etched in black or silver into the metal for a beautiful contrasting look. All frames come with matching finish hardware hider caps. All frames are made from sturdy rustproof heavy gauge stainless steel, and guaranteed for a minimum of 4 years of exterior use. Clear polyurethane doming is added to the nameplate for protection and an enhanced look. Matching frame finish hardware hider caps are included to complement your frame. Each frame is packaged in a recyclable PET display box. Available township names: Balboa Island, Corona del Mar, Huntington Beach, Laguna Beach, Newport Beach, San Clemente, & Surf City. Beautifully crafted from heavy gauge alloy and coated with an architectural grade wear-resistant black coating. Each set is precision laser photo etched with historic images of the world's most famous racecars. The base of our coasters are lined with high quality, soft felt which prevents scratching and insulates furniture. Water and heat resistant to protect furniture. Easy to clean, simply use a damp cloth and wipe. Recyclable PET retail display packaging. Laser photo etched detail gives each coaster a vintage look and feel. A cosmetic upgrade that protects an investment in nitrogen technology. Prevents tires from inadvertently being filled with air. Lightweight chrome plated or satin finished ABS is compatible with Tire Pressure Monitoring System (TPMS). All caps feature an inner O-Ring seal to ensure a clean valve orifice. Nitrogen logo protected by clear doming which gives each piece a jewelry quality look. Knurled head provides grip and allows for easy installation and removal, without a wrench. A picture frame that will last as long as the memories it contains. 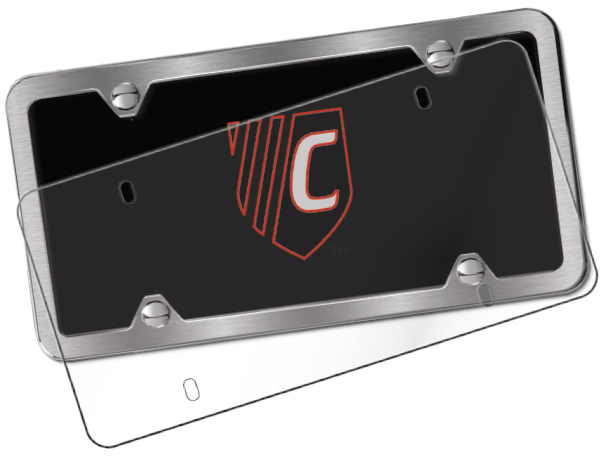 Stainless steel license plate frame and matching hardware caps. Attractive mat board, fits 4" x 6" photos. Hinged easel support and durable metal wall hanger. Custom designed front or rear brackets for easy installation via a port or factory installed program. Fits standard U.S. 6" x 12" state license plates. Made from 20 gauge 304 stainless steel and available in powder coated black and brushed finishes. All brackets include installation hardware and instructions.